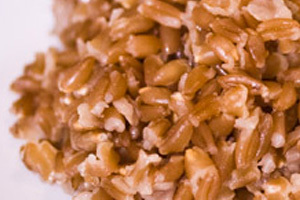 Farro (aka Emmer) is an old world heirloom grain found in traditional European and Near Eastern dishes (particularly peasant dishes from Tuscany). Many preparations call for the whole grain farro berries to be soaked ahead of cooking to help tenderize them, but this recipe just simmers them on the stove, making it a very quick and convenient way to enjoy this delicious and nutritious nutty grain. Use this recipe as a side dish, or add other flavors to turn it into a grain salad. You can easily make this a vegetarian/vegan recipe by replacing the chicken stock with homemade vegetable stock. 1. Rinse the farro grains. 2. Sweat the onions until translucent in an oiled saucepan. 3. Add the farro and toast for about a minute, stirring frequently. 4. Add the chicken stock, bring to a boil, cover and reduce the heat to low. 5. Simmer for about 25 minutes, stirring occasionally. 6. Once the farro is cooked through, fluff with a fork, add salt & pepper to taste, and serve. I adore farro. It is a clear winner in terms of protein and fiber, and is nutty and delicious. Thanks for bringing it to more people’s attention!